If you need to share information from your database with someone, but don't want them actually working with your database, you should consider creating a Report. Reports allow you to organize and present your data in a reader-friendly, visually appealing format. 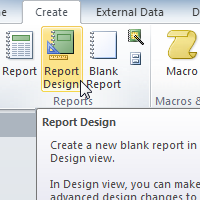 Access 2010 makes it easy to create and customize a report using data from any query or table in your database. In this lesson, you will learn how to create, modify, and print reports.